One of the major epics of India and the longest poem in the world, the Mahabharata is a sacred Hindu text. It consists of many legends and tales revolving around the conflicts between two branches of a mythical family. The stories—which involve deities, demigods, and heroes—contain elements of cosmology, philosophy, and religious doctrine. A section of the epic called the Bhagavad Gita is the most important religious text of Hinduism. Origin, Setting, and Background. Although tradition holds that an ancient sage, or wise man, called Vyasa wrote the Mahabharata, it was almost certainly composed by a number of different poets and then collected into a single work sometime between 400 B . C . and A . D . 200. The epic reached its present form about 200 years later. It contains nearly 100,000 verses and is divided into 18 sections called parvans. The Mahabharata is set in the kingdom of Kurukshetra on the northern plains of India along the Ganges River. The opening parvans explain the ancestry of the major characters and provide background for the central conflict of the work. That conflict begins when the rightful heir to the throne of Kurukshetra, a blind prince named Dhritarashtra, is passed over in favor of his younger brother Pandu. Instead of taking the throne, however, Pandu goes to the Himalaya mountains to live as a hermit, leaving Dhritarashtra on the throne after all. Rivals for Power. Before Pandu left Kurukshetra, his two wives gave birth to five sons, who became known as the Pandavas. They lived at the royal court with their cousins, the 100 sons of Dhritarashtra known as the Kauravas. When the Pandavas came of age, the eldest, Yudhishthira, demanded the throne from his uncle, claiming that he was the rightful heir. A feud broke out between the two branches of the family, and the Kauravas eventually forced the Pandavas into exile in the forest. While in exile, the Pandavas entered a tournament to win the hand of a beautiful princess named Draupadi. The Kauravas also entered the contest, but the Pandava brother Arjuna won the princess, who became the common wife of all five Pandavas. After the tournament, King Dhritarashtra called the Pandavas back to his court and divided the kingdom among them and his own sons. Unhappy with this settlement, the Kauravas challenged the Pandavas to a game of dice and won back the entire kingdom by cheating. Once again, the Pandavas were forced into exile. The Mahabharata is a sacred Hindu text and the longest poem in the world. Its story revolves around conflicts between two branches of a mythical family. 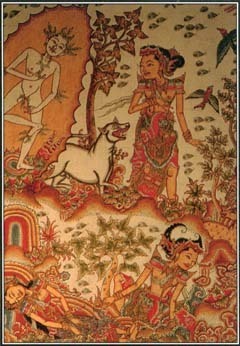 This painting illustrates a scene from the poem. War and Aftermath. After many years of wandering, the Pandavas returned to reclaim the kingdom, but the Kauravas refused to give up control and both sides prepared for war. The god Krishna, a relative of both the Pandavas and Kauravas, supported the Pandavas. Although he took no part in the fighting, he served as charioteer for the Pandava brother Arjuna and gave him advice. Their conversations make up the section of the Mahabharata known as the Bhagavad Gita. The Pandavas and Kauravas met in a series of battles on the plains of Kurukshetra. In the end, the Pandavas emerged victorious after killing all their cousins. The Pandavas gained the kingdom, and the oldest brother, Yudhisthira, took the throne. The Pandavas ruled peacefully, although their uncle Dhritarashtra mourned the loss of his sons and frequently quarreled with his nephews. Dhritarashtra eventually went to live in the forest and died there. Some time later, Yudhisthira gave up the throne and went with his brothers and their wife, Draupadi, to live on Mount Meru, the heaven of the god Indra. Other Tales and Impact. The conflict between the Pandavas and Kauravas makes up only a portion of the Mahabharata. The work includes many other tales about deities and heroes and covers an enormous range of topics. The stories present complex philosophical ideas that form the basis of the Hindu faith—codes of conduct, social duties, and religious principles. The Mahabharata became immensely popular in India and throughout Southeast Asia. The work inspired many ancient works of art, such as Indian miniature paintings and the elaborate sculptures of the ancient temples of Angkor Wat and Angkor Thorn in Cambodia. Today the Mahabharata remains the most important Hindu epic and continues to serve as the foundation for religious faith and mythology. See also Bhagavad Gita ; Hinduism and Mythology ; Indra ; Krishna .